Looking for Windows PowerShell commands for general IMAP migrations? See Use PowerShell to perform an IMAP migration to Office 365. 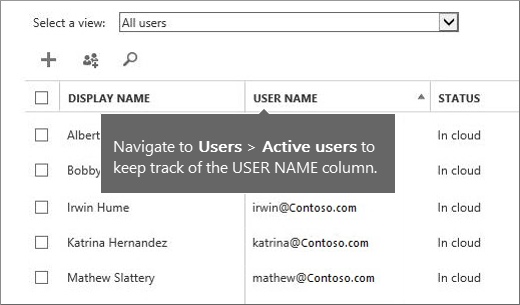 You'll have to create your users in Office 365 before you migrate their IMAP mailboxes from the source system. Each user has to have an existing Office 365 mailbox to which you import their mail to. If you use a domain with your IMAP system and also want to use it with Office 365, you will have to add it to Office 365 as an accepted domain before you create users in Office 365. For instructions, see Add a domain to Office 365. If you are using Office 365 operated by 21Vianet in China, see Add your domain and users to Office 365 operated by 21Vianet. To add users, see Add users individually or in bulk to Office 365 - Admin Help, or for Office 365 operated by 21Vianet see Add, edit, delete or restore user accounts in Office 365 operated by 21Vianet - Admin Help. Office 365 needs the name of the source email system, sometimes referred to as a server, from which you want to migrate mailboxes. There are many ways to get the name of your email system. The easiest way is by using an email client that's connected to your email system. In this task, we describe how to get the name of the system by using Outlook Web App . If your email client isn't described here, contact support for your source email system. In Outlook Web App, on the toolbar click Settings > Options > Mail > Accounts > POP and IMAP. Below your account information, you'll see a link that says Settings for POP and IMAP access. Your IMAP server's name is listed under IMAP setting. 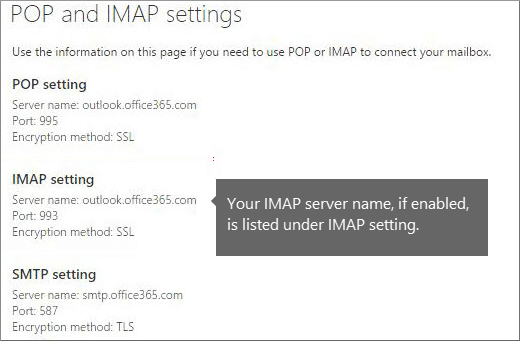 See Use POP or IMAP to connect to Office 365 for business or Microsoft Exchange accounts for more information on IMAP connections in Office 365. You either know the passwords to each user's mailbox, or you reset the passwords to new passwords that you do know. Follow the steps in Create the list of user mailboxes when you know the user passwords, or you'll reset the passwords . 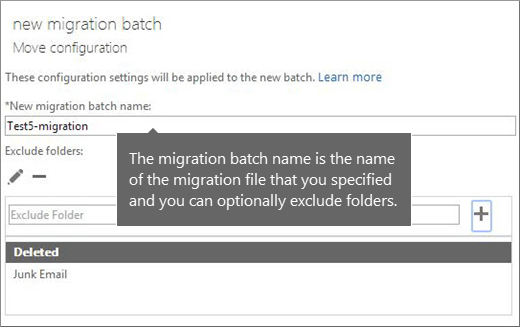 When you create a migration file in this task, you type your mailbox admin credentials and usernames using a special format. This allows you to access user mailboxes without knowing or resetting the user passwords. We provide the format used by Exchange, Dovecot, and Mirapoint IMAP servers. If your source email system isn't listed here and you don't know the correct format, you still have the option of resetting user passwords. Skip this task and go to Create the list of user mailboxes when you know the user passwords, or you'll reset the passwords . Go to the Exchange admin center. 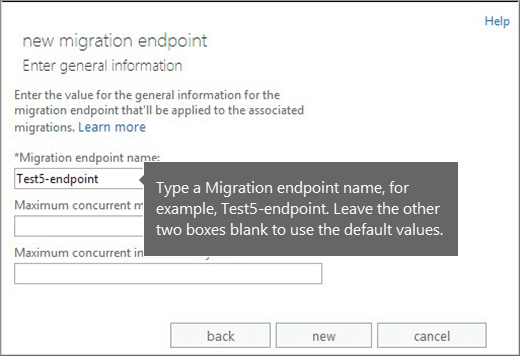 In the Exchange admin center, go to Recipients > Migration > More > Migration endpoints. When Outlook Web App opens, send an email message to the another Office 365 user to verify that you can send email.